It has been five years since the horrific terror attack at Fort Hood and the Obama Administration has yet to lift a finger to help the victims. 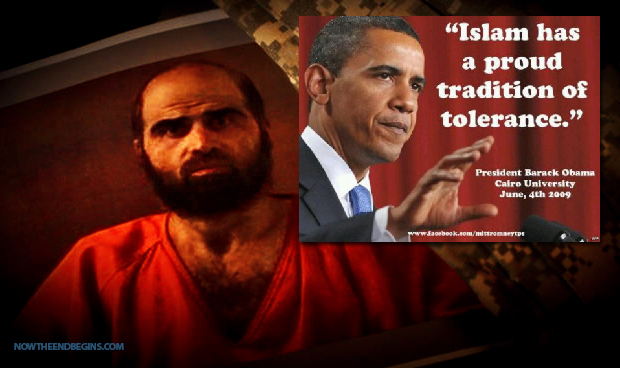 “Five years ago today, the terrorist Nidal Hasan yelled “Allah akbar” and, wearing the uniform of an U.S. Army major, began slaughtering Americans. Fourteen innocent people lost their lives and over fifty were injured. For five years, Hasan has bragged of committing this atrocity in the name of Islam to protect the Taliban. Hasan’s victims saw their lives forever changed that terrible day. But the real tragedy of Fort Hood was that our government could have easily prevented their suffering. The U.S. Army and FBI had long known that Hasan was a jihadist with al-Qaeda connections and, simply by following their own standard policies and procedures, easily could have stopped him before anyone was hurt. Instead, because of what the Senate Homeland Committee’s investigation called “political correctness,” the government willfully averted its eyes to Hasan’s jihadism. Hasan should have been arrested. Instead, he was promoted and given other special privileges. Incredibly, the government’s policies of political correctness and special privileges for Hasan continued even after his killing spree. The day after the carnage, on November 6, 2009, Department of Homeland Security Secretary Janet Napolitano said that U.S. authorities “were taking measures to quell anti-Islam sentiments” in the U.S. and that Hasan “does not, obviously, represent the Muslim faith.” On November 8, 2009, Army Chief of Staff Gen. George Casey said on the Sunday talk shows that the “real tragedy” of Fort Hood would be damage to “diversity” policies and publicly warned against “guessing at Hasan’s motive,” though the government knew of Hasan’s jihadist motive from the start. Though the government went out of its way to coddle Hasan, it had no kindness for his victims. First, they were used as props in staged “mourning” ceremonies to benefit political leaders, then they were personally promised assistance by President Obama and top generals, and finally they were shoved down a memory hole. 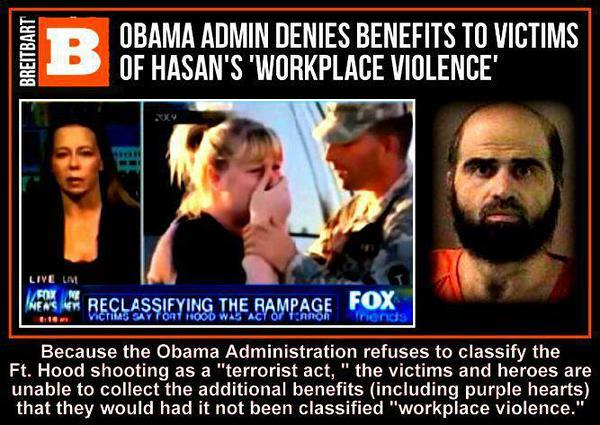 Hasan’s terrorism became “workplace violence,” meaning that those who survived the charnel house were denied support, benefits and mental health treatment. In some cases, soldiers were physically and mentally abused for requesting treatment of Fort Hood-related injuries. Now, from our new Congress, we call and hope for action. First, we ask for equity. Congress should provide similar benefits to the Fort Hood victims as it provided to the 9/11 Pentagon victims. The government should not be allowed to dodge its culpability. Second, we ask Congress hold oversight hearings to investigate and hold accountable the Department of Defense and the White House for their post-attack policies, conduct and abuse. Political correctness caused multiple deaths at Fort Hood and mass child abuse in Rotherham, England. Yet the fundamental evil of political correctness, beyond even the body count, is the damage done to the public’s faith in our leaders. The officials who call Fort Hood “workplace violence” also say that “ISIS is not Islamic.” Who can, or should, believe them? The victims of Fort Hood have heard many expressions of sympathy and promises of help from the President, the Chief of Staff and powerful Senators. But there has been no aid and no action. The time for answers, for action and for justice has long passed.